Thank you all for the many prayers for us during Jacklyn’s pregnancy. We are almost there and are looking forward to holding our sweet baby GIRL in just a few weeks!!! 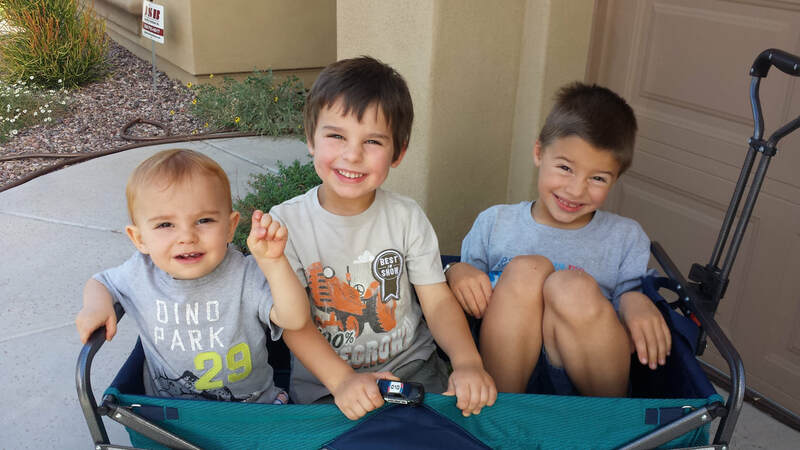 Sharing the news that it’s a girl with the boys was super fun – all three of them are beyond excited to meet her. What’s new in the training? Back in March, Frank took a two-week maintenance course in Los Angeles, CA. This was at the actual Robinson helicopter factory where all their helicopters are produced. Yes, it was BIG! Now that he has successfully passed the course, he is authorized to sign off the required inspections for this helicopter! Robinson Helicopters has three massive buildings and produce around 8 helicopters each week. 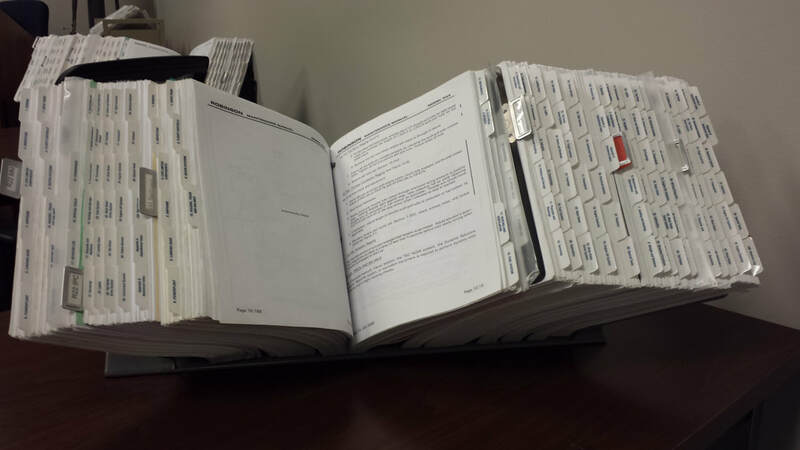 Thousands of pages of manuals that Frank used extensively throughout the course. 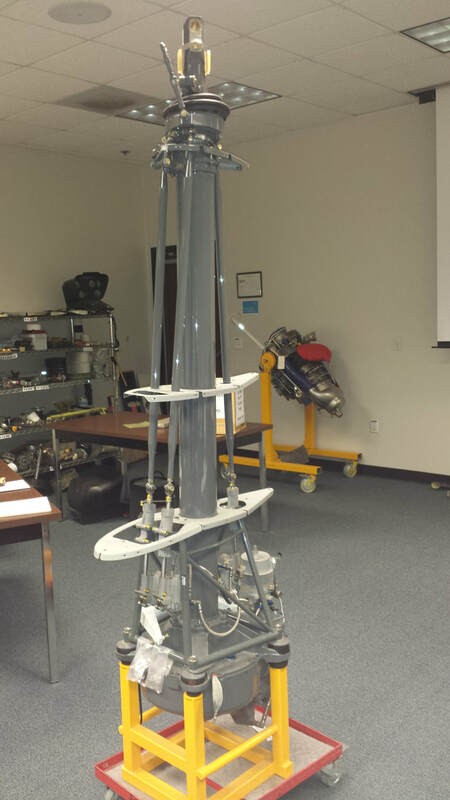 This is what the “guts” of Frank’s helicopter looks like – complete with the main rotor gearbox, hydraulic system, mast and flight control linkages. Behind and to the right is the Rolls Royce 300 turbine engine that powers the R66. The focus of Frank’s flight training over the past few months has been on learning to instruct in the helicopter. This Thursday, May 3rd, is the big test he has been building up to! He will be tested all day both orally and practically (in the helicopter) to add on helicopter to his Certified Flight Instructor rating. These helicopter maneuvers have been some of the most challenging flight maneuvers Frank has done in all his aviation experience up to this point. Please pray for clarity of mind and a solid focus through the final hours of studying as well as during the test. Pray for agreeable weather for the flight and, most importantly, that his focus through it all will be fixed on the glory of Christ, whatever the outcome. 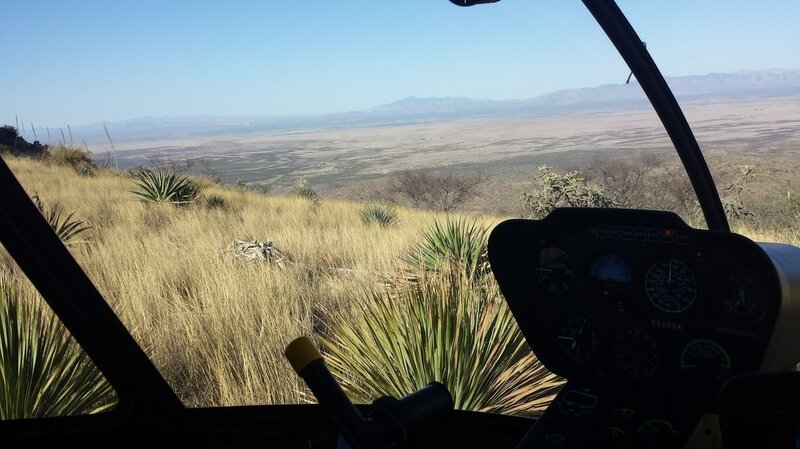 One requirement to be a helicopter flight instructor is to be able to do “full down autorotations”. We’ve included a video of this below. This is basically a simulated engine failure taken all the way to the ground. At 500ft above the ground, the engine throttle is rolled off and it is no longer spinning the rotor. The pilot uses the upward airflow through the rotor as the helicopter falls to keep it spinning. The helicopter then must be landed safely, in a specific zone, and without the option of adding engine power to ensure a good outcome. You can hear the rotor slowing down at the end as the last bit of its energy is used to set the helicopter gently down on the ground. In a few weeks, we plan to head up to Phoenix where we will deliver our baby much closer to medical care than we have here in McNeal. When we return, Frank will wrap up some advanced training as well as begin instructing a new student until September. After that point, things have become a little more uncertain and God has been teaching us to wait on Him and trust Him with His great plan that we are yet to discover. Please be praying for wisdom as we work through changes and transitions and seek out what God is doing through them. 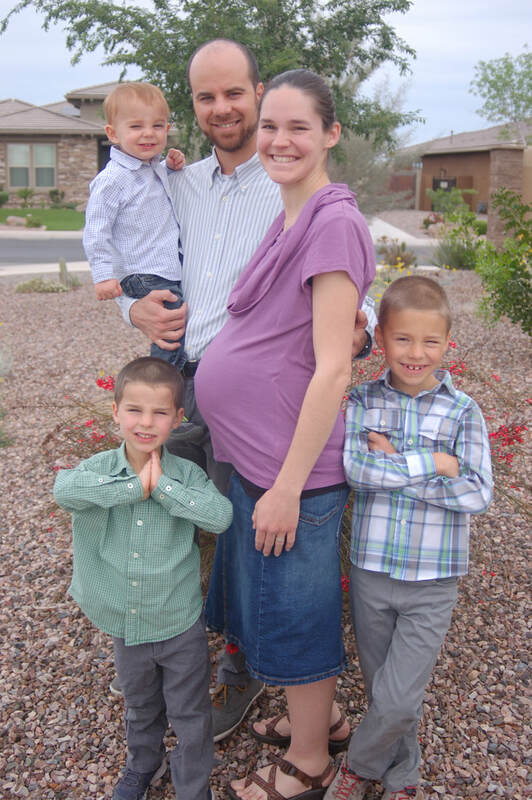 Thank you for praying for our family through Jacklyn's pregnancy. Though it's not over yet, the morning sickness has dramatically improved and we are so grateful to be functioning within a semi-normal routine once again. Jacklyn has a renewed appreciation for the ability to cook meals, wash dishes and laundry, and accomplish other basic household tasks while taking care of the kids on her own - praise the Lord for the little jobs that He has given to each of us to accomplish for His glory! As you can imagine, our last few months have looked a little different than we anticipated. But God is good and He is teaching us to trust Him more and more through each step. While we won't be leaving the country in July as we had planned, Lord willing, we WILL still move overseas this year! At this point, we are pushing forward in the training for Frank to become certified to instruct in the helicopter. Simultaneously, Frank is also starting the advanced portion of the training where he will fly in the mountains, practice limited power approaches and learn to carry a "sling load" under the helicopter. In the video below, you can see a landing zone Frank recently flew to. It's about 6ft x 8ft and on the side of a mountain. At the very beginning, you can look down the mountain into the valley below. Next you can see the ledge he landed on and then up to the top of the mountain. One recent highlight for us was a month long trip to Florida visiting with family and reconnecting with friends. There were many chances to share about the ministry God has led us to and our vision to see thriving churches planted in the most remote corners of the world. While we were there, Frank was given an exciting opportunity to preach at the church he grew up in. Thank you South Orlando Baptist Church for blessing us with this time to share our passion on a Sunday morning! If you are interested in hearing what he shared, we've included it here! On February 24th NTM Aviation (now officially Ethnos360 Aviation) will be hosting a large event to allow people in the area to get a taste of what we are all about. There will be helicopter rides (Frank will be one of the pilots), kids activities, lots of displays with missionaries who can talk about what we are doing in various countries and tell stories of when they were there. Plus there will be a simulated tribal village that puts people in the missionary's shoes. Please pray that our guests will pick up the vision and that God will work in their hearts through the event to help them to think on a more eternal level. Also, please consider this an open invitation for those of you close enough to drive down and attend! Our faithful God is so merciful to lavish upon us blessings through difficult times. Most often, these blessings are hidden and may not even be recognized for months or years. Nevertheless, they are there. James 1 tells us to count it all joy when we meet trials. Why? Because that testing will produce a steadfastness that leads to a completeness, lacking in nothing. The testing pushes us into a deeper dependence on the true Perfect One. Not easy, but true. Sometimes the blessings are not completely hidden. In our marriage, God has graced us 3 times with a wonderful gift accompanied by trial. For us, this is pregnancy. The one clear gift at the end of the 9 month journey is so obvious as we press forward to the goal of a beautiful new addition to our family. But that beautiful baby comes with the high cost of a very difficult pregnancy. That being said, we have wonderful news to share with you – baby #4 coming end of May! Wonderful, yet not without trial and we covet your prayers during this season. God has certainly used the last couple months to stretch us, refine us and push us to our max when we already thought we were there. This baby, in God’s divine wisdom and timing, has come to teach us and strengthen our family. Please pray for perseverance. Pray for teachable hearts. Pray for us to trust His timing as we consider our timeline for moving overseas and how this should affect it. Pray for wisdom to know how much is healthy for our family to take on as we strive to persevere in our preparations for serving overseas. Thank you - your prayers keep us going! 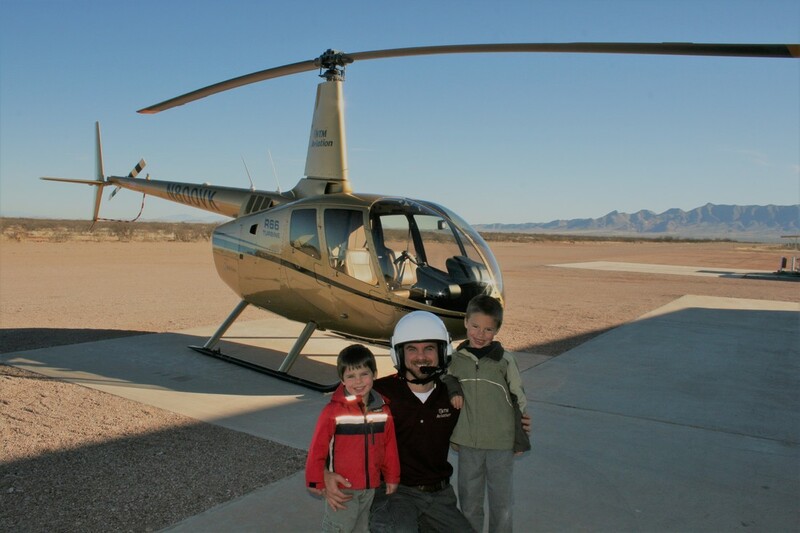 Our next big step in the training is for Frank to add on helicopter to his Certified Flight Instructor rating. This is pretty involved and probably won’t happen in the time frame we had originally planned. But we are stepping forward and trusting God with the timing. Frank recently completed his first flight from the instructor’s seat. Everything looks and feels different from there. It was like going back to his early training days all over again – for now, it takes a lot more mental energy to achieve less than desirable results in areas he hardly had to even think about anymore! Please pray for wisdom and a clear mind for Frank during this next step in the training. Last of all, a fun update – the passenger flights we mentioned last month went fabulously! 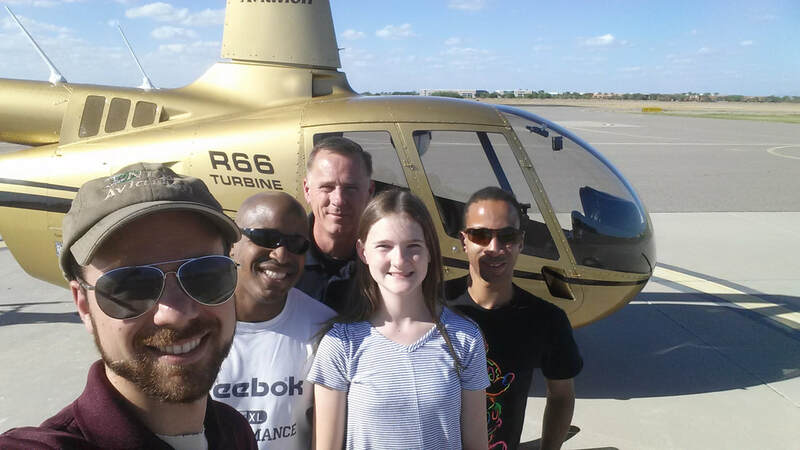 Frank flew well over 150 passengers and was super blessed by our community up in Gilbert. 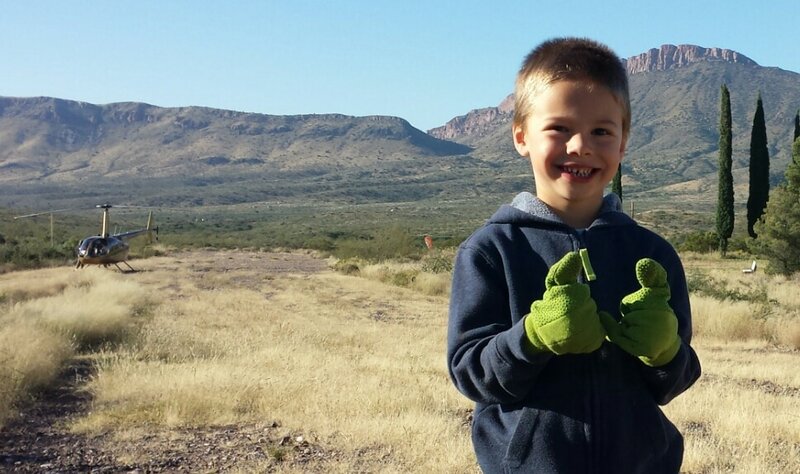 He gained valuable experience and had a blast flying each one of them. Thank you to all of you who participated. Actually, you can get a taste of what the flights were like because one of his passengers put together this great video. Thank you, Mark! 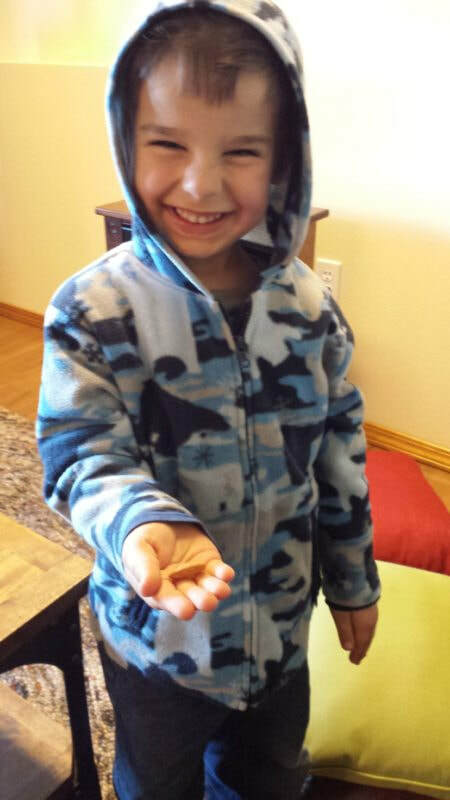 We had Toby was retested for the nut allergy he had as a toddler and we are thrilled to say that Toby outgrew his nut allergy!! Now we can being the process of testing each nut for any eczema reaction. This is especially important to us as we'll have much less control over when he has contact with nuts once we move overseas. Praise God with us for this huge answer to prayer! Toby eating his very first nut EVER! 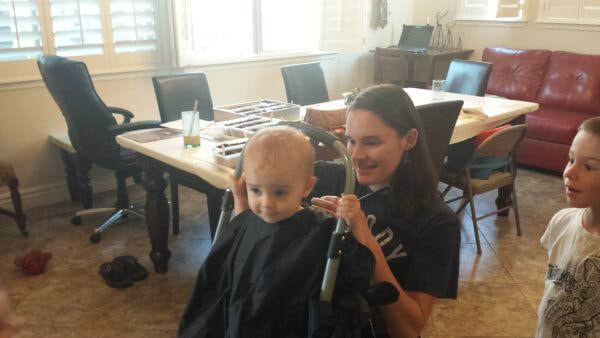 ​Another big event - Logan's first haircut! Trust me, getting Jacklyn to finally agree to do this makes it a BIG deal. ​The main event since you last heard from us - a trip up north! And wow, what a trip! We just returned back to Arizona after this 23 day trip back "home" to Spokane, WA. 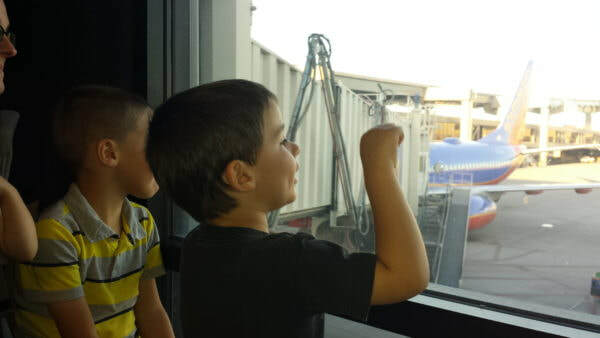 It had been over 2 years since the boys had been on an airline and they were THRILLED! ​Averaging about three events on the calendar each day, we might have packed things a little full. ;-) But what an encouragement to be back at Faith Bible Church, to spend time catching up with old friends, and to meet new friends as we presented about the ministry God has us in at seven different bible study groups! Please pray that God would continue to work in the hearts of those we shared with as they consider partnering with us in church planting through prayer and finances. So much time with so many wonderful friends. Here, Frankie and Logan are learning the game Battleship. 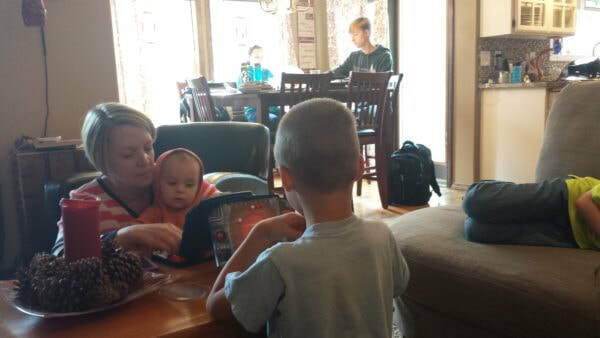 The boys loved their time in Spokane seeing all their Washington friends. Thank God with us that He provides friends in our lives who withstand the test of time. Presenting to groups about missions used to be nerve-wracking and intimidating. But, as God has worked in our hearts and minds, it has grown to be a joy that we look forward to doing. It is a profound privilege to be used by God - to collectively lift our gaze up out of our daily routines and think again on His plans for us and His plan for the world which He set in motion thousands of years ago. It's a reality we so easily lose sight of. With that in mind, we recently decided to share some of our FAVORITE missionary videos with you all. We've put together a list - go ahead and peruse it, pick one (or a lot!) out, and enjoy! We are praying that you'll find this to be a wonderful resource and encouragement. To view the list, click here. Or to watch one we think you'll love, click here. All right, Arizona friends - want to go up for a ride? Well Frank would love to take you up! And if you're in the Phoenix area, you're in luck! 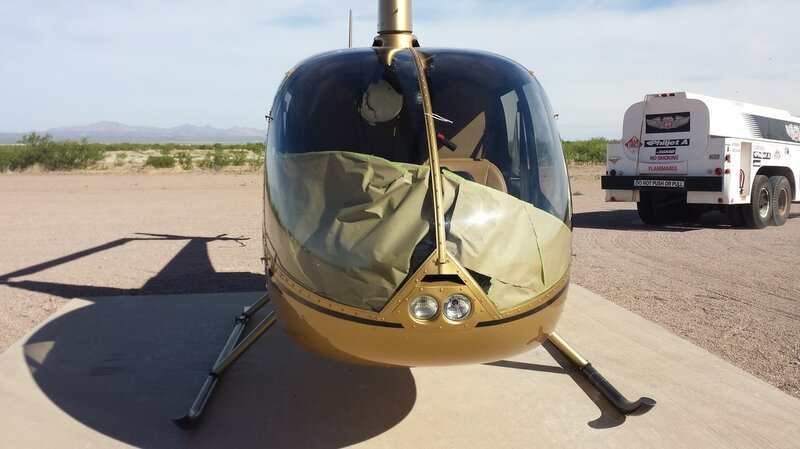 Frank will have the helicopter up in Chandler from October 27th - November 7th. 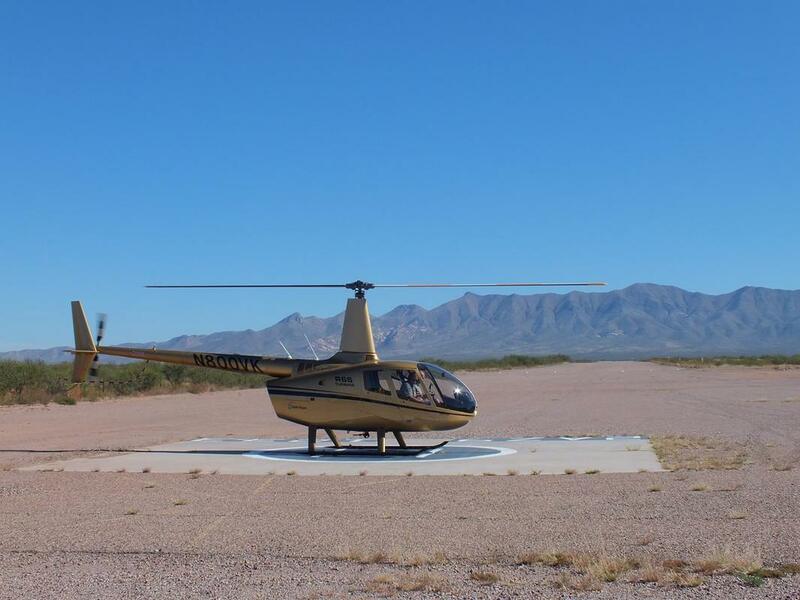 The purpose of the trip is to build experience flying the helicopter when it is filled with passengers. So we need you! If you're interested in a flight, you must let us know soon so we can schedule you in! And for everyone else who is bummed that you're missing out - here's an open invitation to come and visit us in McNeal, Arizona. We have a wonderful guest house you can stay in, it's a beautiful area, and we'll take you for a personal tour in the helicopter! 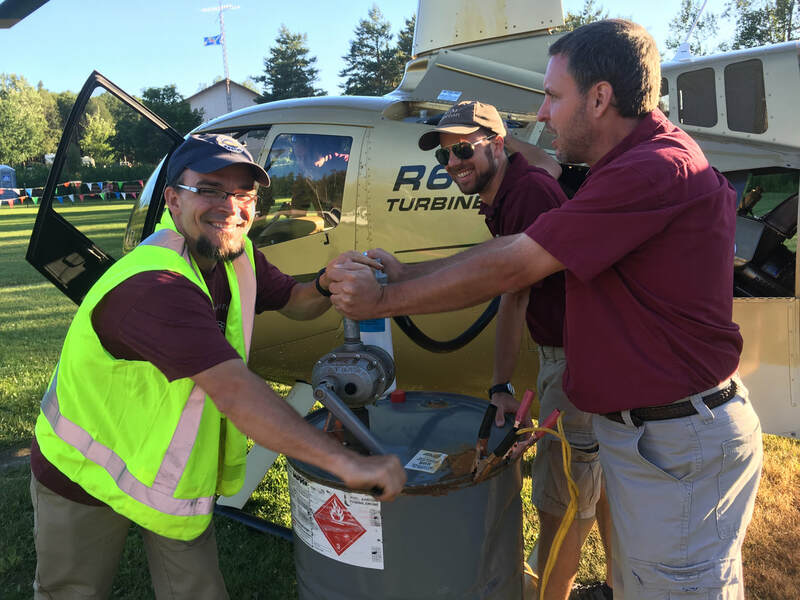 Over the summer Frank and two other NTMA pilots had the opportunity to fly the helicopter up to Ontario, Canada. No, this is not something one would normally do in a helicopter. Yes, there were many fuel stops along the way – about every two and a half hours. However, it was well worth it! Here is a picture of the route to Canada. Each dot represents a stop along the way! You see, this year is special for us at Ethnos360 (formerly New Tribes Mission) – it’s our 75th anniversary! And to celebrate, our Canadian home office hosted a large open house event and requested that we participate by giving rides in our helicopter. It was a wonderful opportunity to share the vision and necessity of aviation in tribal church planting and how it is used to build Christ’s kingdom. During the event, Frank gave 28 rides to excited passengers, many of whom had never been up in a helicopter before. It was a blast to give them a taste of Aviation and share why it is so important to missions. 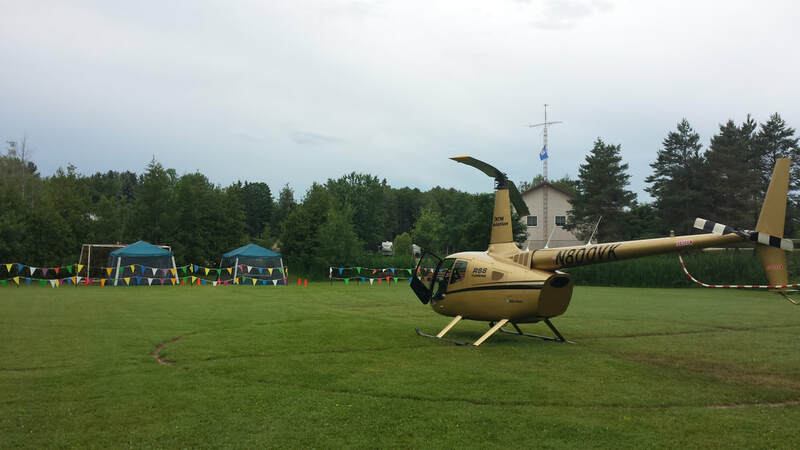 The soccer field served as the helipad on the windy Canada day. Below is one of Frank's flights. The clip cut out from the middle was the brief passenger swap between flights. Franks skills sure have come a long way! 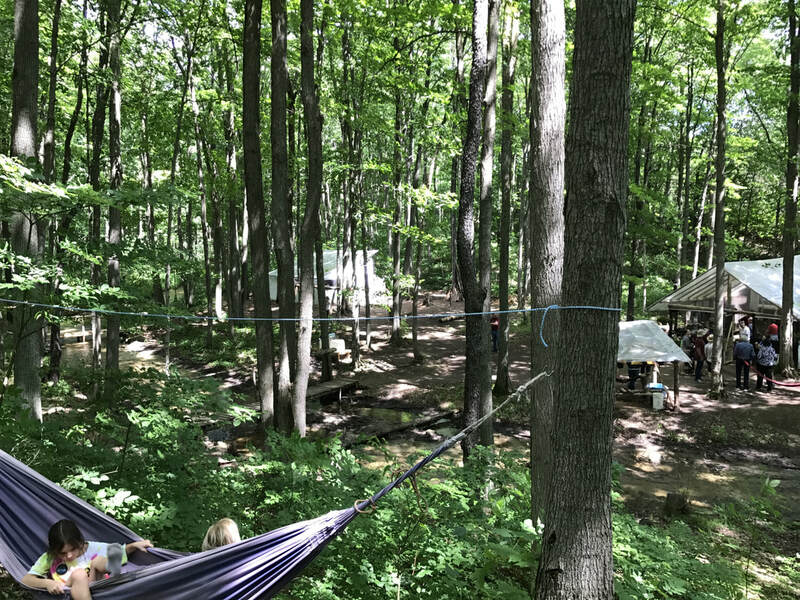 Alongside the helicopter rides, this open house had another special attraction – Jungle Camp. Picture it. It’s just you and your family. You are out in the woods, far away from civilization. And this is where you will be for the next six weeks. No electricity or running water. Not exactly a walk in the park! This is what we call “Jungle Camp”. The missionaries in training go out to the woods and build a jungle house from trees, plastic sheet and duct tape. No nails, no plywood. And then they live in those houses for six weeks, completely isolated from civilization. No one comes, no one goes. A few of the jungle camp houses tucked away in the woods. This is a great way to prepare these missionaries for the early days of their ministry. They will be dropped off with a few simple supplies in a remote tribal location. They are not going anywhere, the only people to interact with are their teammates, and they need to learn to live in an entirely new way. 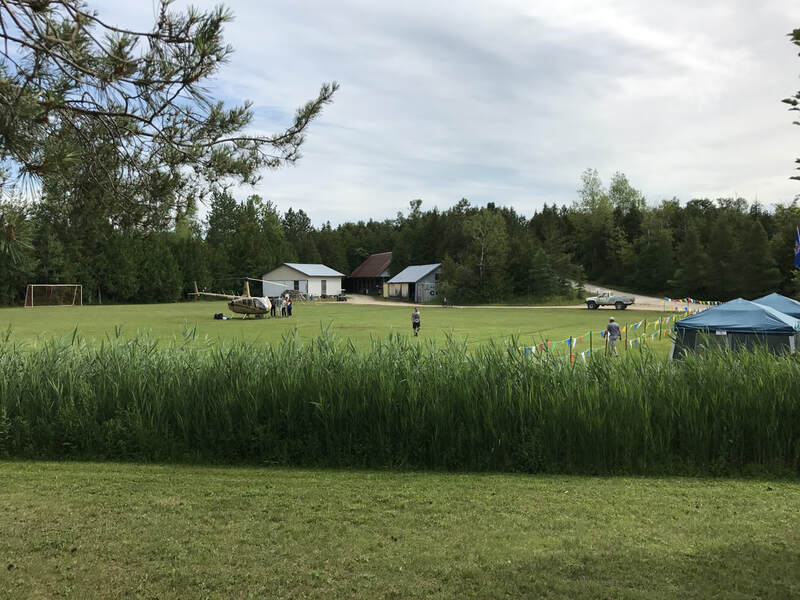 Our missionary training center up in Canada was in the middle of their Jungle Camp training during the celebration event. Frank enjoyed participating in a simulated package delivery for the students. The isolated Jungle Camp students each put in an order of 10kg of supplies. 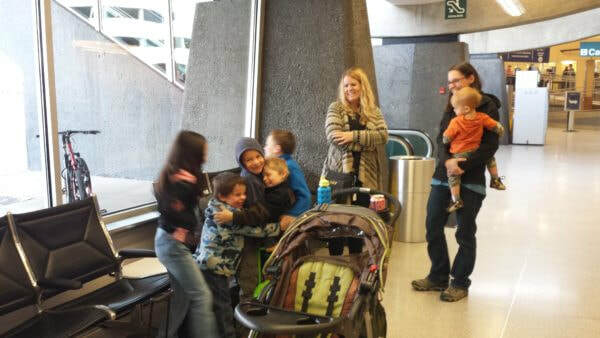 Their supplies were purchased, boxed and delivered to them via helicopter! 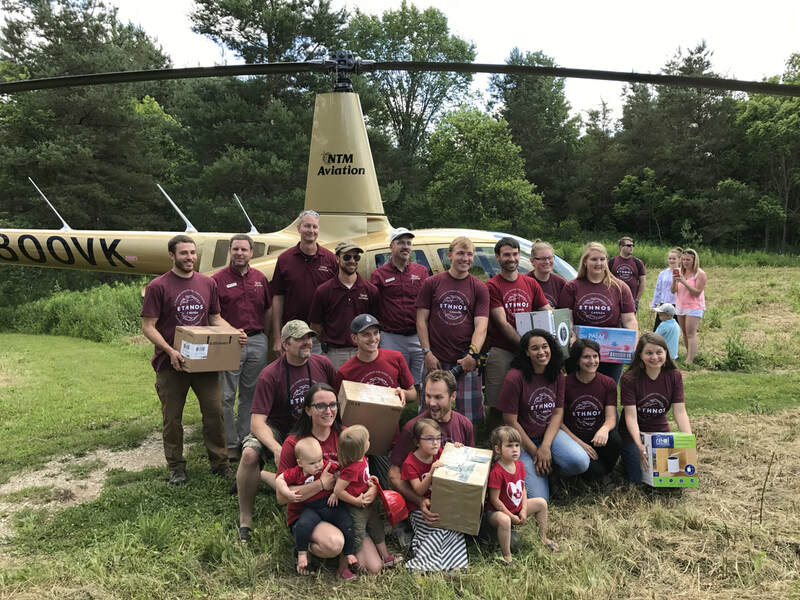 Even after being isolated in the woods for only 5 weeks at that point, some of the missionaries described the helicopter delivery as very encouraging and a little emotional. This trip was a blessing to our family in another way as well. Because this trip was planned by NTM Aviation they covered ALL the flight costs. That means that the 25 hours Frank put into his experience bank were not charged to our account. 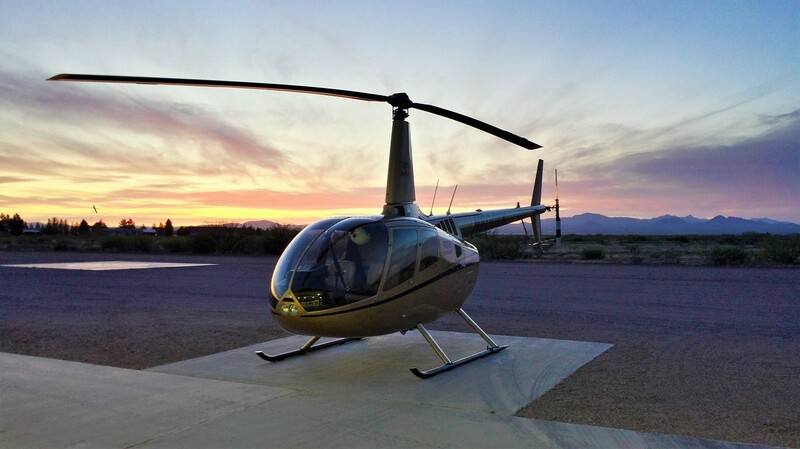 Praise the Lord for cutting $6,000 off our helicopter bill in a unique and unexpected way! Frank is about half way through the helicopter training! Next up is some advanced training and flight instructor certification. Your faithful prayers and support are a huge part of making this happen. THANK YOU!! Fueling between rides. It takes a team to keep all this going. Your prayers and support are the foundation of this team! Washington friends – we’re coming this fall. Let’s get together! Florida friends – we’re coming for Christmas. We will look forward to getting together in early January. 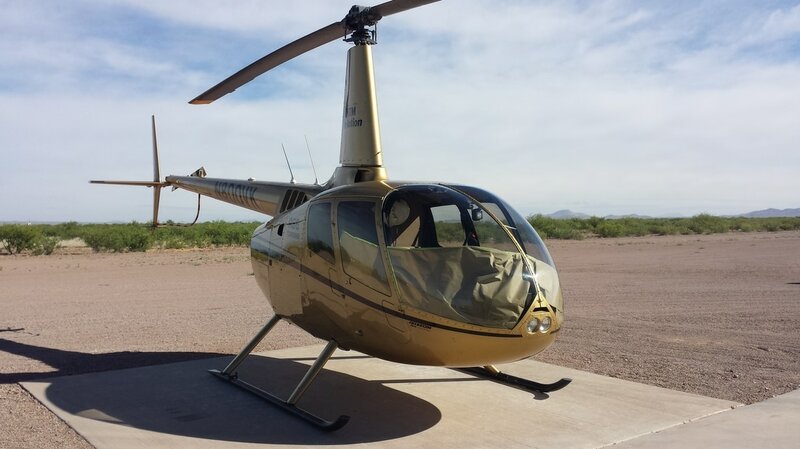 Arizona friends – Frank will be giving helicopter rides in Phoenix sometime in the near future. Let us know if you’re interested! 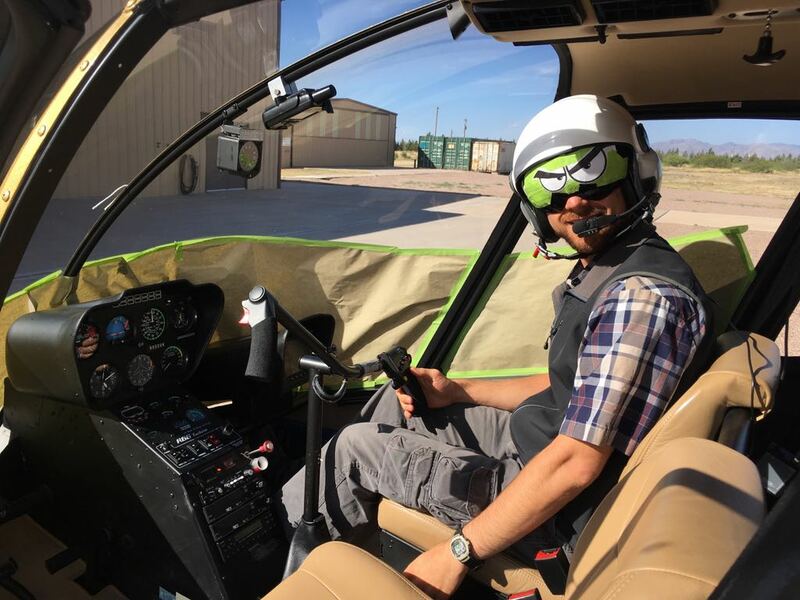 Last week Frank flew up to Phoenix in the helicopter and spent an afternoon taking an oral and practical exam (aka, flight) in order to test for his Commercial Helicopter License. By God's grace and for His glory HE PASSED the test and is now a "real" helicopter pilot - Praise the Lord! This puts him at about a third of the way through the total helicopter training. 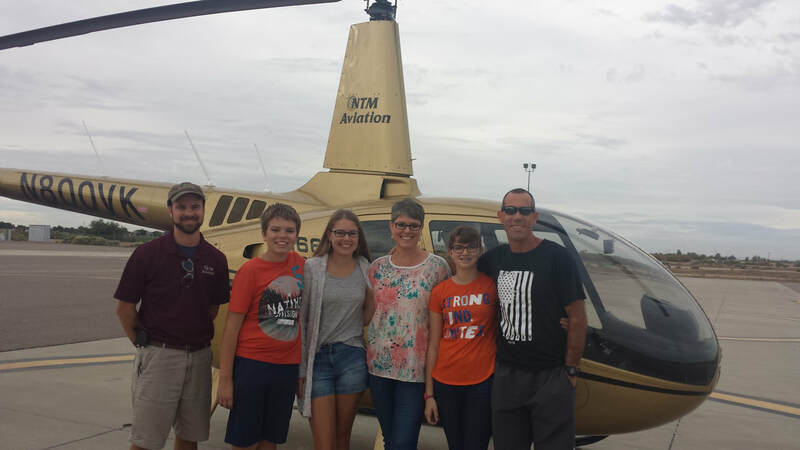 From this point on he will be transitioning into advanced training in order to more specifically prepare him as a missionary helicopter pilot. First minutes as a "real" helicopter pilot! Before this class, Frank had never even heard of DC soldering. This type of soldering is a great tool for missions because you don't always have an outlet to plug into but you will likely have a 12 volt battery nearby! Thank you for praying - just today our Philippine team flew their new R66 helicopter out to a tribe for the very first time! This is exciting to us because our team in McNeal spent several months working hard to prepare and ship it over there in time to keep the program continually functioning. And here it is - its FIRST flight once reassembled and ready for service in the Philippines! Night Vision and No Vision! 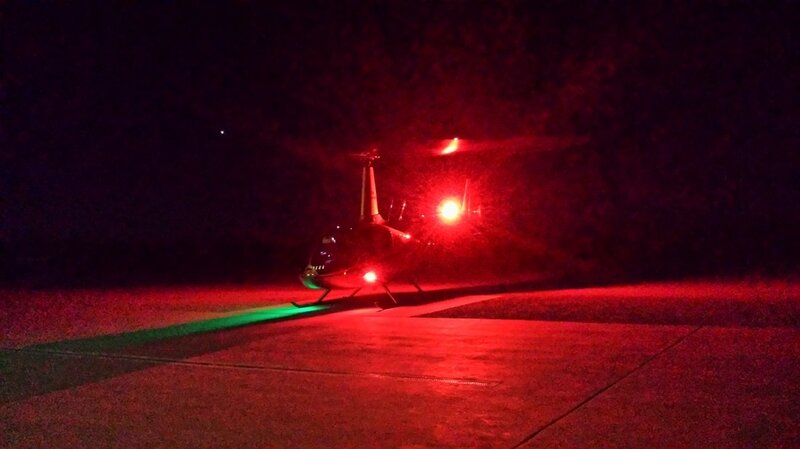 One of the requirements I need to meet for my commercial helicopter license is five hours of flying solo at night. I landed on Tuscon's main runway just before and after two airliners landed, saw a shooting star, avoided all the mountains, flew through some turbulence but came home in one piece. I think I still prefer flying during the day! These pictures were taken from a solo flight up to a mountain ridge 3000' above the valley below. One of the great advantages of a helicopter over an airplane is that we can land almost anywhere. 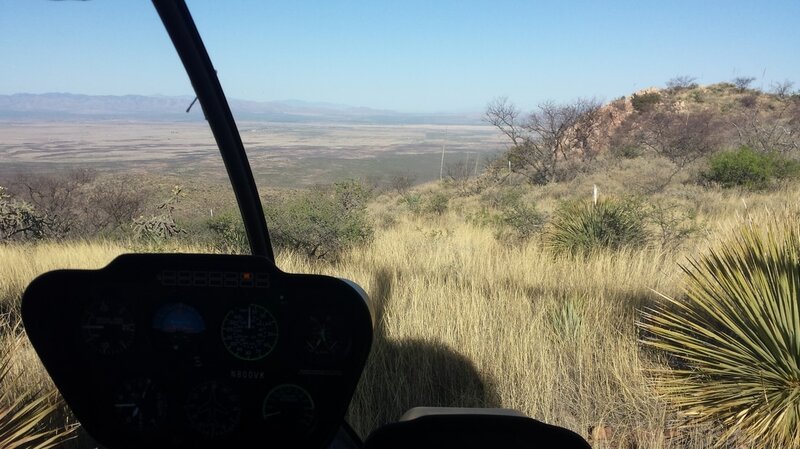 Two of the more difficult places to land are pinnacles (up on a mountain ridge or a hospital helipad) and confined areas (down in a deep pit or tight among some tall trees). 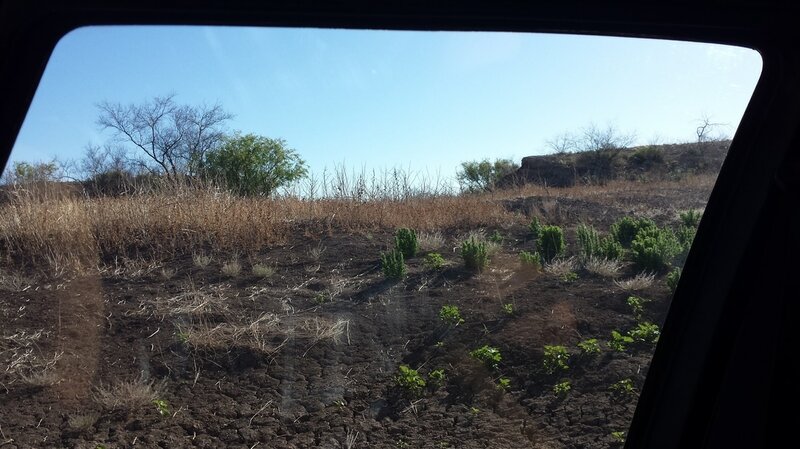 It's hard to tell, but in these pictures I have landed down in a large pit. Thank you all for your faithful prayers, support and encouragement to our family. You are a blessing beyond words! 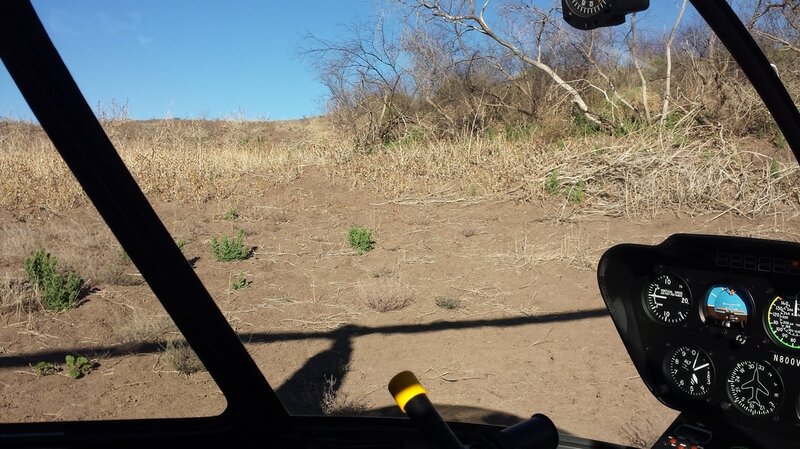 As we shared in our last blog post, Frank has been training to become a helicopter pilot. This has been a shift in our original plans based on the request of NTM Aviation to meet a specific need in the Asia-Pacific region. For about the last month, Frank has spent each morning in the helicopter. Praise the Lord that, though it is very challenging, the training has been going well! With God's help we made it to the first Solo! This morning Frank went up in the helicopter for the first time completely ALONE! Praise the Lord for safety and success! Soloing has been an exciting event for us, but this milestone has also brought us to the end of the finances God has provided so far for the helicopter training. While we know that God can provide the remaining $56,000 in a variety of ways, we are specifically asking Him to provide it through monthly supporters. If we were 100% funded in our overseas monthly budget right now, we would have just what we need to cover the helicopter training costs through to the end. And this way, when the training is complete, we would already be fully funded and able to meet the desperate need in the Asia-Pacific region even sooner! Skills and fame can only impress on a human level - they are not where we find our worth. Perhaps Frank will become an amazing helicopter pilot, save countless lives and help plant many tribal churches. Or, maybe things won’t go as we plan and it will appear that he has failed as a pilot. But at the core of who we are, this is irrelevant. Because our worth is not coming from this training or the ministry we hope to accomplish through it, we can find confidence in Christ. It is for Christ and His blood at the cross that we strive. The amazing truth is that our worth is found solely in what’s been done for us – not in anything we could ever accomplish ourselves! 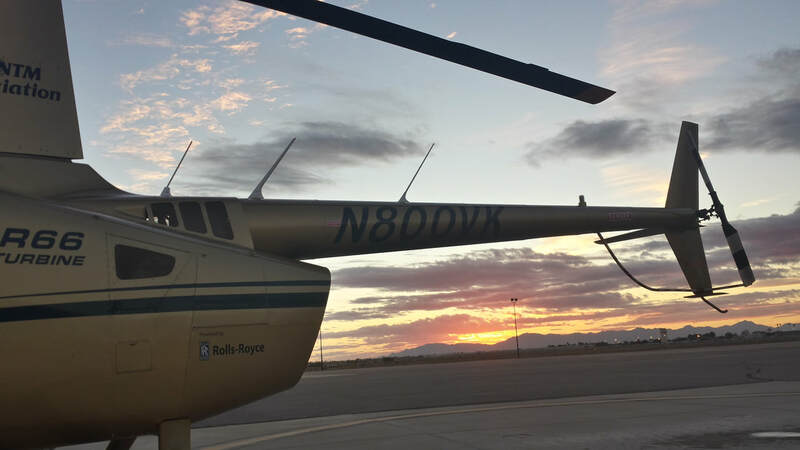 NTM Aviation uses both airplanes and helicopters around the world to support tribal church planting. Each has its different pros and cons. Often, a flight program will choose to have both. 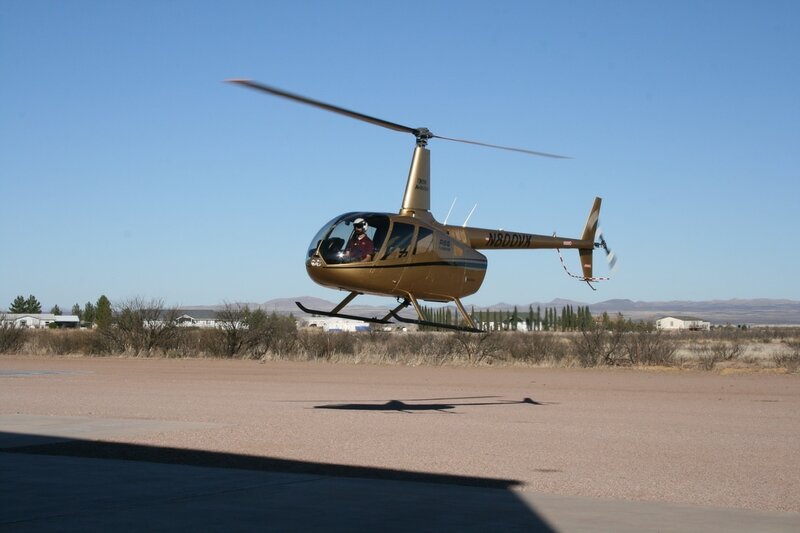 At the beginning of this year, NTM Aviation leadership asked us to consider transitioning from airplane to helicopter. They have a very specific and urgent need on a large island in the Asia-Pacific region and they would like to use our family and a helicopter to meet that need. Currently, both church planters and mature tribal churches on the island have no aviation support and are desperately awaiting help from NTMA. This was a big shift in our thinking! We were supposed to wrap up here in May, raise our final support and then fly airplanes overseas. But we prayed a lot, made a pro/con list, and sought out counsel from many godly people. In the end, we felt that everything was a green light. Everything that is, except for the finances. At $300/hour, helicopter training adds up fast. That’s $1 every 12 seconds. Total – around $60,000. Daunting, to be sure! But should our answer really all come down to the money? The helicopter training is a good fit for our family right now. It’s a good fit for the churches we’re connected with. It’s a good fit for NTM Aviation and meets their most pressing need. Trusted friends and mentors said it was a good fit. And as a bonus, Frank has always had the desire to fly helicopter. If God gives us green lights everywhere, but we can’t see how exactly He’ll provide the resources, should we still move forward? Is it financially responsible to turn down the training? Or is it a step of faith where we will miss out on a big opportunity from God to grow in trusting Him? After much prayer and counsel, we said YES! No, there’s no guarantee that Frank will be able to successfully complete the helicopter training. No, there’s no guarantee that we’ll ever get to that island or that there’ll be a helicopter waiting there when we arrive. No, there’s no guarantee that God will see fit to provide the $60,000 as we would like. Regardless of these things, we believe that God is asking us to step out in faith and accept this opportunity to prepare to be used by Him in a new way to multiply the efforts of missionaries, national pastors and tribal churches overseas! And so, this was week 1 of helicopter training. 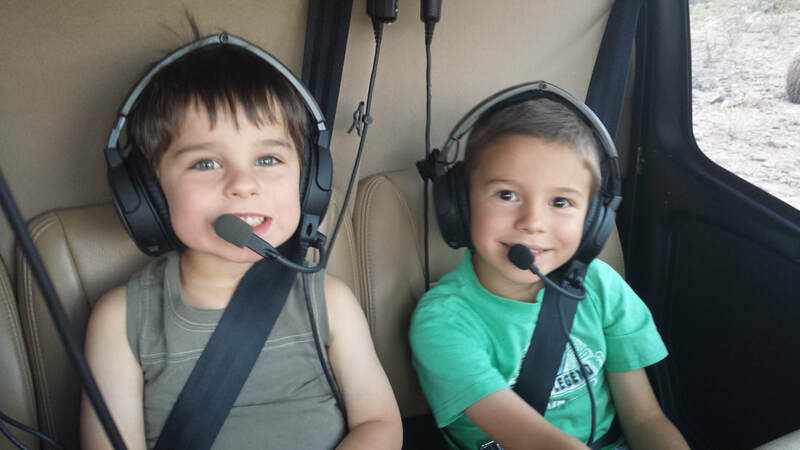 Turns out, flying a helicopter is NOT like flying an airplane! They said that hovering was supposed to be the hardest part – they weren’t kidding. This video was taken five minutes into Frank’s first helicopter training flight. Every time you see the helicopter stabilize over the helipad you will know it is the instructor handling the controls. Praise the Lord for quality instructors! Now you’re probably thinking, “I’m never going to get in a helicopter with that guy!” That’s ok. But by God’s grace you will feel differently in a few months and we are looking forward to another video to update you on the progress! Please be praying for mental endurance, faith and peace for us as we trust God to provide the finances, and continued unity in our marriage as we take on this huge task together.